With the new bottle washer for the PepsiCo group, Akomag once again brings Italian technology beyond national borders. Akomag is a flexible and dynamic company that bases its policy on customer satisfaction, the quality of its systems, its assistance services and technological innovation. 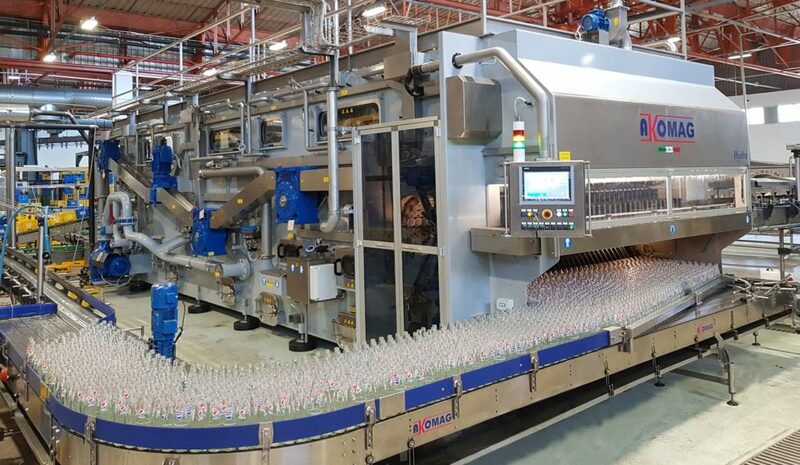 Akomag has been working for several years in the bottling sector and thanks to the proven experience developed in this field, the company can guarantee to its customers maximum yields, user-friendly operation and minimum operational costs, as well as long working life of its machines built with top quality materials. From the province of Parma, Akomag aims to meet the needs of all those who are looking for high quality products. Recently the company delivered, installed and tested a new machine intended for washing recycled glass bottles. The machine for the PepsiCo group is a Hydra 8.2, characterised by a very high production: 37,500 bottles/h. The new model, the pride of mechanical Made in Italy, reaches a mechanical efficiency equal to 99.4%, successfully exceeding the standards required by the customer in the contractual phase. With this new provision, Akomag confirms itself once again as world leader in the construction of glass bottle washers. The bottle washer has been specially designed in order to minimise the environmental impact, with particular attention to water and steam consumptions, and to the duration of the detergent bath. The completely automated wash cycle includes an initial bottle-emptying station followed by a pre-wash spraying and first pre-soak bath that significantly reduces detergent bath pollution and markedly decreases consumption levels. In the pre-soak area the project also provides for the installation of a belt filter that allows to automatically remove the main impurities typical of recycled bottles (straws, paper, cigarette butts, for instance). The washing of bottles is completed with the internal and external high-pressure detergent wash sprays, using self-cleaning and self-centring rotating nozzles. The accurate rinsing is performed with water sprays at decreasing temperature, which accompany the bottles to the final rinse with mains water. Mains water for spray-rinsing. In designing Hydra 8.2, Akomag has focused on the final rinsing sprays using mains water. The expedients developed during the design stage have allowed to achieve extraordinary results. By installing a special valve with integrated flow meter on the mains pipe (controlled directly by the control panel), it is possible to detect the instantaneous and daily water consumption required for the proper washing of the bottles. 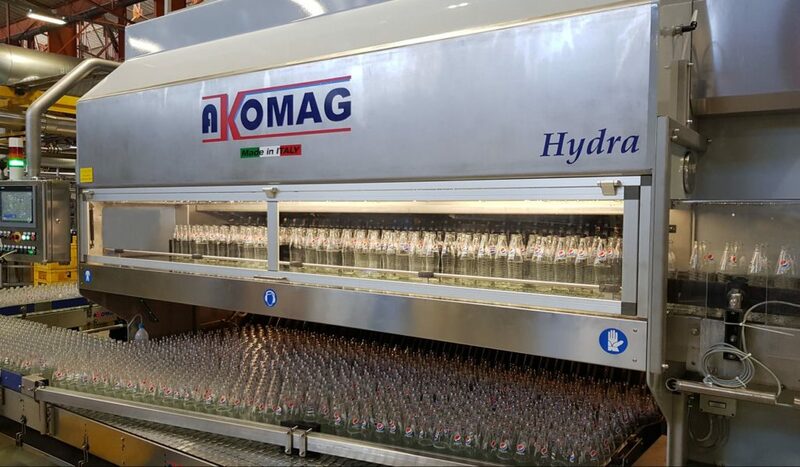 With pride and satisfaction, Akomag technicians declare that thanks to the new design the new machine has a water consumption equal to 0.098 litres per bottle. A lower value than rigidly imposed in contractual phase by the customer. The supply is completed with many other technological innovations, including sensors for slowing down or stopping the machine in case of missing or clogging of the bottles on the conveyor belts; synchronization systems of the bottle washer speed with that of the filling monobloc; control and introduction of detergent and additives in the washing bath and of sequestrants/disinfectants in the spray tanks; self-cleaning filters in the tanks; automatic bottle loading and unloading, perfectly synchronized with the movement of the main chain.